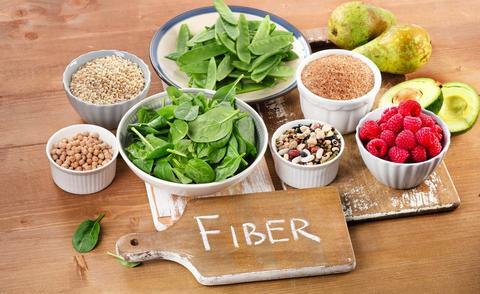 high fiber intake following a diagnosis of CRC is associated with an improved rate of survival. In this study, researchers evaluated 1575 healthcare professionals with stage I to III in 2 prospective cohorts, the Nurses’ Health Study and the Health Professionals Follow-up Study. The patient population consisted of 61.1% women with a mean (SD) age of 68.6 (8.9) years. As noted above, a lower mortality rate was observed in “patients who increased their fiber intake after diagnosis from levels before diagnosis.” Specifically, for “each 5-g/d increase in intake [there] was [an] associated 18% lower CRC-specific mortality (95% CI, 7%-28%; P = .002) and 14% lower all-cause mortality (95% CI, 8%-19%; P < .001).” It was thus concluded that a higher intake of total fiber following diagnosis of nonmetastatic CRC was associated with a lower mortality rate. online November 2, 2017. doi:10.1001/jamaoncol.2017.3684.